Biography*: Arnulf of Flanders (c. 890 – March 28, 965), called the Great, was the third Count of Flanders, who ruled the County of Flanders, an area that is now northwestern Belgium and southwestern Netherlands. Arnulf was the son of count Baldwin II of Flanders and Ælfthryth of Wessex, daughter of Alfred the Great. Through his mother he was a descendant of the Anglo-Saxon kings of England, and through his father, a descendant of Charlemagne. 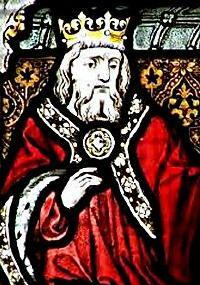 Presumably Arnulf was named after Saint Arnulf of Metz, a progenitor of the Carolingian dynasty. At the death of their father in 918, Arnulf became Count of Flanders while his brother Adeloft or Adelolf succeeded to the County of Boulogne. However, in 933 Adeloft died, and Arnulf took the countship of Boulogne for himself, but later conveyed it to his nephew, Arnulf II. Arnulf I greatly expanded Flemish rule to the south, taking all or part of Artois, Ponthieu, Amiens, and Ostrevent. He exploited the conflicts between Charles the Simple and Robert I of France, and later those between Louis IV and his barons. In his southern expansion Arnulf inevitably had conflict with the Normans, who were trying to secure their northern frontier. 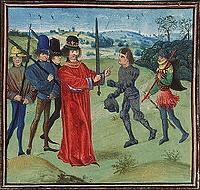 This led to the 942 murder of the Duke of Normandy, William Longsword, at the hands of Arnulf's men. The Viking threat was receding during the later years of Arnulf's life, and he turned his attentions to the reform of the Flemish government. Liutgard, born in 935, died in 962; married Wichmann IV, Count of Hamaland. Baldwin III of Flanders (c. 940 – 962), married Mathilde of Saxony († 1008), daughter of Hermann Billung. [S746] Wikipedia, online http://Wikipedia.com, http://en.wikipedia.org/wiki/Arnulf_I,_Count_of_Flanders. Biography*: Baldwinus II 'de Kale' Graaf van Vlaanderen also went by the nick-name of Baldwin 'the Bald'.5 He succeeded to the title of Graaf van Vlaanderen in 879. Baldwin II (c. 865 – 10 September 918), nicknamed Calvus (the Bald) was the second Count of Flanders and ruled from 879 to 918. He was the son of Baldwin I of Flanders and Judith, a daughter of Charles the Bald and as such a descendant of Charlemagne] In 884 Baldwin married Ælfthryth (Ælfthryth, Elftrude, Elfrida), a daughter of King Alfred the Great of England. The immediate goal of this Anglo-Flemish alliance was to help Baldwin control the lower Canche River valley. The early years of Baldwin's rule were marked by a series of devastating Viking raids into Flanders where little north of the Somme was left untouched. By 883 he was forced northward to the flat marshes of the pagus flandransis which became the territory most closely associated with the counts of Flanders from that time on. Baldwin constructed a series of wooden fortifications at Saint-Omer, Bruges, Ghent, and Kortrijk and seized those lands abandoned by royal and ecclesiastical officials. Many of these same citadels later formed castellanies housing government, militia and local courts. In 888 the west Frankish king Charles the Fat was deposed and there were several candidates for his replacement. As he was a grandson of Charles the Bald, Holy Roman Emperor and King of West Francia, Baldwin could have, but did not, compete for the crown of western Francia. Instead Baldwin joined others in trying to convince the East Frankish king Arnulf to also take the west Frankish crown, but Arnulf declined. The Robertine Odo, Count of Paris, was elected king but Odo would not support Baldwin's attempts at gaining control of the abbey of St. Bertin the two fell out and while Odo attacked Baldwin at Bruges he could not prevail. Baldwin continued his expansion to the south and gained control of Artois including the important abbey of St. Vaast. When the abbey came under the jurisdiction of Archbishop Fulk of Reims in 900 Baldwin had him assassinated. When his attempts to expand further into the upper Somme River valley were opposed by Herbert I, Count of Vermandois Baldwin likewise had him assassinated. He died 10 September 918 at Blandijnberg (near Ghent) and was succeeded by his eldest son Arnulf I of Flanders. His younger son Adalulf was (the first) count of Boulogne. 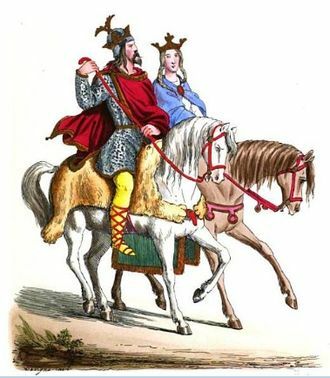 Arnulf I of Flanders (c. 890–964), married Adela of Vermandois. 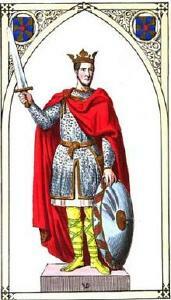 Adalulf (c. 890–933), Count of Boulogne. [S746] Wikipedia, online http://Wikipedia.com, http://en.wikipedia.org/wiki/Adelolf,_Count_of_Boulogne. Biography*: Ælfthryth of Wessex (877 – 7 June 929), also known as Elftrudis (Elftrude, Elfrida), was an English princess and a countess consort of Flanders. She was the youngest child of Alfred the Great, the Saxon King of England and his wife Ealhswith. She had four or five siblings, including King Edward the Elder and Ethelfleda. Ælfthryth married Baldwin II (died 918), Count of Flanders. Ælfthryth was an ancestor of Matilda of Flanders, who married William the Conqueror, first monarch from the House of Normandy, which means that following the Norman conquest of England and the death of William I all the monarchs of England were also descendants of the House of Wessex. [S746] Wikipedia, online http://Wikipedia.com, http://en.wikipedia.org/wiki/%C3%86lfthryth,_Countess_of_Flanders. Institution of Baldwin I 'Bras de Fer', the first count of Flanders by Charles the Bald, the Frankish king. Biography*: Baldwin I (probably 830s – 879), also known as Baldwin Iron Arm (the epithet is first recorded in the 12th century), was the first count of Flanders. At the time Baldwin first appears in the records he was already a count, presumably in the area of Flanders, but this is not known. Count Baldwin rose to prominence when he eloped with princess Judith, daughter of Charles the Bald, king of West Francia. Judith had previously been married to Æthelwulf and his son (from an earlier marriage) Æthelbald, kings of Wessex, but after the latter's death in 860 she had returned to France. Around Christmas 861, at the instigation of Baldwin and with her brother Louis' consent Judith escaped the custody she had been put under in the city of Senlis, Oise after her return from England. She fled north with Count Baldwin. Charles had given no permission for a marriage and tried to capture Baldwin, sending letters to Rorik of Dorestad and Bishop Hungar, forbidding them to shelter the fugitive. After Baldwin and Judith had evaded his attempts to capture them, Charles had his bishops excommunicate the couple. Judith and Baldwin responded by traveling to Rome to plead their case with Pope Nicholas I. Their plea was successful and Charles was forced to accept. The marriage took place on 13 December 862 in Auxerre. By 870 Baldwin had acquired the lay-abbacy of St. Pieter in Ghent and is assumed to have also acquired the counties of Flanders and Waasland, or parts thereof by this time. Baldwin developed himself as a very faithful and stout supporter of Charles and played an important role in the continuing wars against the Vikings. He is named in 877 as one of those willing to support the emperor's son, Louis the Stammerer. During his life Baldwin expanded his territory into one of the major principalities of Western Francia, he died in 879 and was buried in the Abbey of St-Bertin, near Saint-Omer. Baldwin was succeeded by his and Judith's son, Baldwin II (c. 866 – 918). The couple's first son, Charles, named after his maternal grandfather, died at a young age. His third son Raoul (Rodulf) (c. 869 – murdered 896) became Count of Cambrai around 888, but he and his brother joined king Zwentibold of Lotharingia in 895. In 896 they attacked Vermandois and captured Arras, Saint-Quentin and Peronne, but later that year Raoul was captured by count Heribert and killed. A nineteenth-century depiction of Judith and her third husband Baldwin. Biography*: Judith, Princesse de France was born between 843 and 844. She was the daughter of Charles I, Roi de France and Ermentrude d'Orléans. She married, firstly, Æðelwulf, King of Wessex, son of Ecgbeorht, King of Wessex and Redburga (? ), on 1 October 856 at Verberie sur Oise, France. She married, secondly, Æthelbald, King of Wessex, son of Æðelwulf, King of Wessex and Osburga (? ), in 858. She married, thirdly, Baldwin I 'de Ijzeren' Graaf van Vlaanderen circa 863 at Auxerre, France.1 She died in April 870. As a result of her marriage, Judith, Princesse de France was styled as Queen Judith of Wessex on 1 October 856. Her marriage to Æthelbald, King of Wessex was annulled in 860 on the grounds of consanguinity. Judith of Flanders (or Judith of France) (c. 843 – c. 870) was the eldest daughter of the West Frankish King and later Holy Roman Emperor Charles the Bald and his wife Ermentrude of Orléans. Through her marriages to two Kings of Wessex, Æthelwulf and Æthelbald, she was twice a queen. Her first two marriages were childless, but through her third marriage to Baldwin, she became the first Countess of Flanders and an ancestress of later Counts of Flanders. One of her sons by Baldwin married Ælfthryth, a daughter of Æthelbald's brother, Alfred the Great. She was also an ancestress of Matilda of Flanders, the consort of William the Conqueror, and thus of later monarchs of England. In 855 King Æthelwulf of Wessex made a pilgrimage to Rome, and on his way back in 856 he stayed at the court of the West Frankish king, Charles the Bald. In July Æthelwulf became engaged to Charles's daughter, Judith, who was no more than fourteen, while Æthelwulf was about fifty years old, and on 1 October 856 they were married at Verberie in northern France. The marriage was a diplomatic alliance. Both men were suffering from Viking attacks, and for Æthelwulf the marriage had the advantage of associating him with Carolingian prestige. In Wessex it was not customary for kings' wives to be queens, but Charles insisted that his daughter be crowned queen. The marriage provoked a rebellion by Æthelwulf's eldest surviving son, Æthelbald, probably because he feared displacement by a higher born half brother. However father and son negotiated a compromise under which Æthelwulf received the eastern districts of the kingdom and Æthelbald the western. It is not known whether this meant that Æthelwulf took Kent and Æthelbald Wessex, or whether Wessex itself was divided. Once King Æthelwulf was dead, Æthelbald, his son, against God's prohibition and Christian dignity, and also contrary to the practice of all pagans, took over his father's marriage-bed and married Judith, daughter of Charles, king of the Franks, incurring great disgrace from all who heard of it. Judith was still childless when Æthelbald died in 860 after a reign of two and a half years. Following Æthelbald's death, Judith sold her properties in Wessex and returned to France. According to the Chronicle of St. Bertin, her father sent her to the Monastery at Senlis, where she would remain "under his protection and royal episcopal guardianship, with all the honour due to a queen, until such time as, if she could not remain chaste, she might marry in the way the apostle said, that is suitably and legally." Presumably, Charles may have intended to arrange another marriage for his daughter. However, around Christmas 861, Judith eloped with Baldwin, later Count of Flanders. The two were likely married at the monastery of Senlis at this time. The record of the incident in the Annals depicts Judith not as the passive victim of bride theft but as an active agent, eloping at the instigation of Baldwin and apparently with her brother Louis the Stammerer's consent. Unsurprisingly, Judith's father was furious and ordered his bishops to excommunicate the couple. They later fled to the court of Judith's cousin Lothair II of Lotharingia for protection, before going to Pope Nicholas I to plead their case. The Pope took diplomatic action and asked Judith's father to accept the union as legally binding and welcome the young couple into his circle – which ultimately he did. The couple then returned to France and were officially married at Auxerre in 863. Baldwin was given the land directly south of the Scheldt, i.e. : the Country of Flanders (albeit an area of smaller size than the county which existed in the High Middle Ages) to ward off Viking attacks. Although it is disputed among historians as to whether King Charles did this in the hope that Baldwin would be killed in the ensuing battles with the Vikings, Baldwin managed the situation remarkably well. Baldwin succeeded in quelling the Viking threat, expanded both his army and his territory quickly, and became a faithful supporter of King Charles. The March of Baldwin came to be known as the County of Flanders and would come to be one of the most powerful principalities of France. Judith was still living in 870. 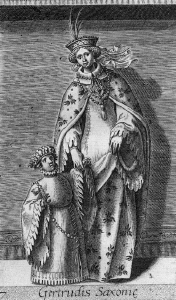 Biography*: Gertrude of Saxony (c. 1030 – August 4, 1113), also known as Gertrude Billung, was a countess consort of Holland, and a countess consort of Flanders by marriage. She was regent of Holland during the minority of her son. She was the daughter of Bernard II, Duke of Saxony and Eilika of Schweinfurt. She married Floris I, Count of Holland (c. 1017 – June 28, 1061) c. 1050, and upon his death, her son Dirk V became Count of Holland. Since he was still young, she became regent. When Dirk V came into power, William I, Bishop of Utrecht, took advantage of the situation, occupying territory that he had claimed in Holland. Gertrude and her son withdrew to the islands of Frisia (Zeeland), leaving William to occupy the disputed lands. In 1063 Gertrude married Robert of Flanders (Robert the Frisian), the second son of Baldwin V of Flanders. This act gave Dirk the Imperial Flanders as an appanage – including the islands of Frisia west of the Frisian Scheldt. She and her husband then acted as co-regents for the young count. Albert (b. c. 1051), a canon in Liege. Dirk V (c. 1052, Vlaardingen–17 June 1091). Peter (b. c. 1053), a canon in Liége. Floris (b. c. 1055), a canon in Liége. Adela (b. c. 1061), who married Count Baudouin I of Guînes. Robert II of Flanders (c. 1065 – October 5, 1111). Adela (d. 1115), who first married king Canute IV of Denmark, and was the mother of Charles the Good, later count of Flanders. She then married Roger Borsa, duke of Apulia. Gertrude, who married Theodoric II, Duke of Lorraine, and was the mother of Thierry of Alsace, also later count of Flanders. Philip of Loo, whose illegitimate son William of Ypres was also a claimant to the county of Flanders. 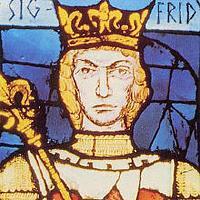 Biography*: Siegfried (or Sigefroy) (c.?922 – 28 October 998) is considered the first count of Luxembourg. He was actually count in the Moselgau and the Ardennes. He was also the advocate of the abbeys of Saint-Maximin de Trêves and Saint-Willibrord d'Echternach. He is speculated to be the son of Count Palatine Wigeric of Lotharingia and Cunigunda. He is the founder of the House of Luxembourg, a cadet branch of the House of Ardennes. He had possessions from his father in Upper Lorraine. At the centre of his dominions he constructed the fortress of Luxembourg in 963. A town soon grew up around the castle. Though he used the title of count, the title "count of Luxembourg" was only applied to William some 150 years later. Biography*: Hedwig of Nordgau (circa 922 – after 993) was the wife of Siegfried of Luxembourg, first count of Luxembourg and founder of the country. They were married circa 950. Biography*: William I Talvas (c. 995 – 1052), seigneur of Alençon. According to Orderic Vitalis his nickname Talvas meaning shield, presumably alluded to his hardness or callousness like that of a shield. He was a member of the House of Bellême. He was a son of William of Bellême and Mathilde of Condé-sur-Noireau. He held lands at Bellême, Domfront and Alençon, He obtained the lands of Bellême from his brother Yves de Bellême, Bishop of Séez who held them of the King of France while Alençon was held of the Duke of Normandy and Domfront of the Count of Maine. While as treacherous and self-serving as any of his family before him he surpassed them in wickedness and cruelty. He had married a Hildeburg, daughter of a nobleman named Arnulf, but he had his wife strangled on her way to church, according to Orderic, because she loved God and would not support his wickedness. William married secondly a daughter of Ralf de Beaumont, Viscount of Le Mans. Among the private feuds going on during the minority of Duke William was one that erupted between William Talvas and William fitz Giroie. William fitz Giroie was a vassal of William Talvas and his father Giroie, Lord of Échauffour had assisted Talvas' father and uncle in the struggles against Herbert I Wake-dog, Count of Maine. William fitz Giroie himself had greatly assisted William Talvas in obtaining his own lands, apparently by force. But William fitz Giroie was also a vassal of Geoffrey de Mayenne, an adherent, in turn, of the Count of Maine. About 1044 William Talvas attacked the castle of Montaigu which was being defended by William fitz Giroie. Unable to defeat the castle William Talvas captured Geoffrey de Mayenne and held him prisoner until William Fitz Giroie destroyed the castle of Montaigu. William fitz Giroie immediately razed his own castle to free his lord and in return Geoffrey de Mayenne built fitz Giroie a new castle at St. Cenery on the river Sarthe. This apparently caused great resentment in William Talvas. On the occasion of his second wedding, William Talvas invited William fitz Giroie to attend. Suspecting nothing fitz Giroie while a guest at the festivities was suddenly seized by Talvas' men and imprisoned, then according to Orderic horribly mutilated and blinded before being released. Somehow William Giroie survived his torture and mutilation and retired to Bec Abbey to live out the remainder of his life as a monk. To avenge this atrocity the sons and kinsmen of William fitz Giroie sacked and destroyed the lands of William Talvas who would not face them in the field. Finally, Talvas' son Arnulf rebelled and exiled his father, now reviled by everyone. He wandered until he was taken in by the de Montgomery family whose son Roger agreed to marry his daughter Mabel in return for the lands William lost. It seems certain that after the death of Arnulf the following year, that William Talvas recovered his lands. William confirmed a gift to St. Aubin of Angers made by his brother Yves circa 1060-2 and after that nothing more is heard of him. Arnulf de Bellême, who deprived his father of his estates and wealth and was dead by 1049. Oliver who after long service in the wars, became a monk at Bec. [S746] Wikipedia, online http://Wikipedia.com, http://en.wikipedia.org/wiki/Walter_Stewart,_3rd_High_Steward_of_Scotland. [S746] Wikipedia, online http://Wikipedia.com, http://en.wikipedia.org/wiki/Gille_Chlerig,_Earl_of_Mar. [S820] DOF - Nov. 27, 1913, Allan Cameron, November 27, 1913. [S709] Diocese of Antigonish, Nova Scotia, Canada.